We have a lot of news which isn't mentioned here, as our time and energy in this area has been channeled into creating monthly email newsletters. You can find these all listed on our Newsletter Archive page. 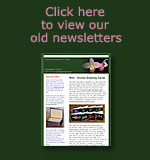 To receive the newsletter each month, simply subscribe by clicking here. 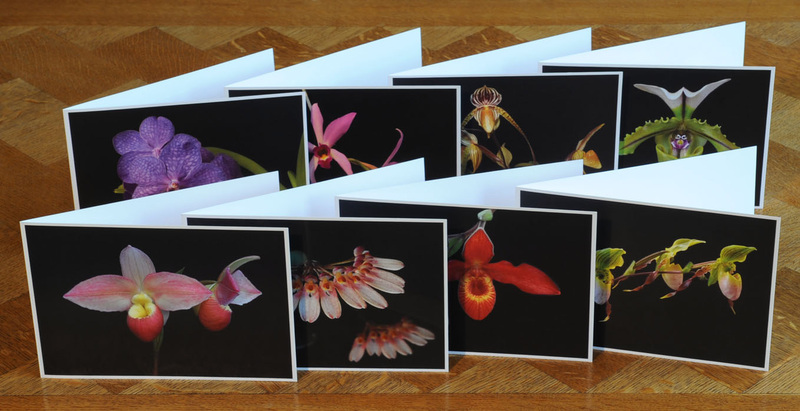 At long last we have produced greeting cards using Don's lovely photos of the orchids. 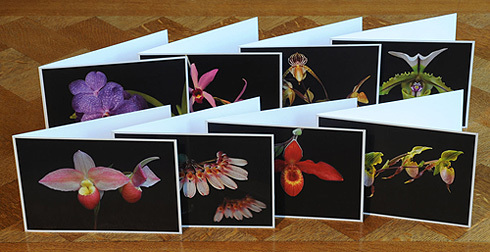 Each of the 8 cards shows a photo of one of the essence orchids, and each card is blank inside so they can be used for virtually any occasion. The cards have no references to either the orchid essences nor to Bach Flower Remedies, in order to keep them 'neutral' so as to appeal to the widest possible market. They are each A5 size (14.8 cm x 21 cm) and are sold with a suitable envelope, either individually or in a box of 16 cards, two of each of the 8. A perfect Christmas present for friends or family! Sprays! We have our sprays available at long last! 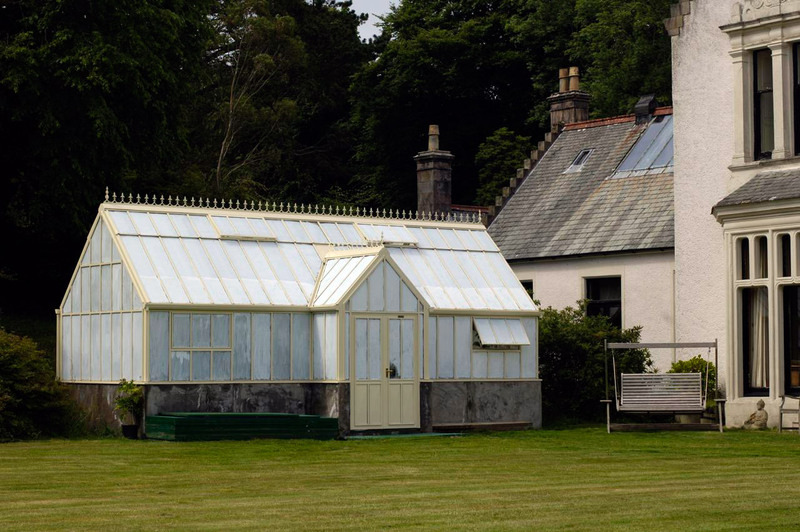 Only 6 years in the making, this was a project that was interrupted by the relocation from the south of England to our new home on the Isle of Gigha at the end of 2003. The sprays are presented with an unusual twist: each of the 6 sprays is available in a choice of two dfiffering essential oil formulations. Over the years Don had noticed that customers would like or dislike a flower essence spray (such as the ones from the Pacific Essences of Canada) purely on the basis of the fragrance of the essential oils used in it. This seemed a shame, as the fragrance was only the side-show of the spray in effect. For example the Abundance Spray from Pacific Essences is meant to bring prosperity into your life, not act as a perfume! Nevertheless, bowing to human nature in its wisdom, Don decided to have two options of essential oils for each of our new sprays. So for example, the White Beauty spray is available (as it has been since we first created it back in the autumn of 1999) with Rose Otto added to it. This is one of those few oils that seems to please a majority of the population. Nevertheless there are some people who either do not like that fragrance, or are allergic to it, and for them they have the option of buying the White Beauty Aura Spray with the essential oils of Sandalwood and Atlas Cedarwood. And so with the other sprays, a choice in each instance of two essential oil formulations, two differing fragrances. We have also committed to using organically certified essential oils whenever this is practicable. So out of the 11 oils we are using, 8 of them are certified by the UK's Soil Association as being organically grown. Sandalwood is simply not available from a certified organic source, so we buy wild-crafted Sandalwood. Rose Otto is astonishingly expensive (about 37 pence per drop...!) and we couldn't justify committing to buying this certified organic, as the cost is about 30% higher or nearly 50 pence a drop. Nevertheless we buy only the finest Bulgarian Rose Otto, and in two of the sprays (White Beauty and Temple of Light) there are drops of Rose Otto and nothing else. It is exquisite, and though roughly 20 times the price of most of the other oils, we will not use any lesser form of rose oil. And then one of the oils is not yet certified, but comes from a source which is in the process of gaining that certification. For fuller information on the new Living Tree Orchid Essence aura sprays, please see our Sprays page. 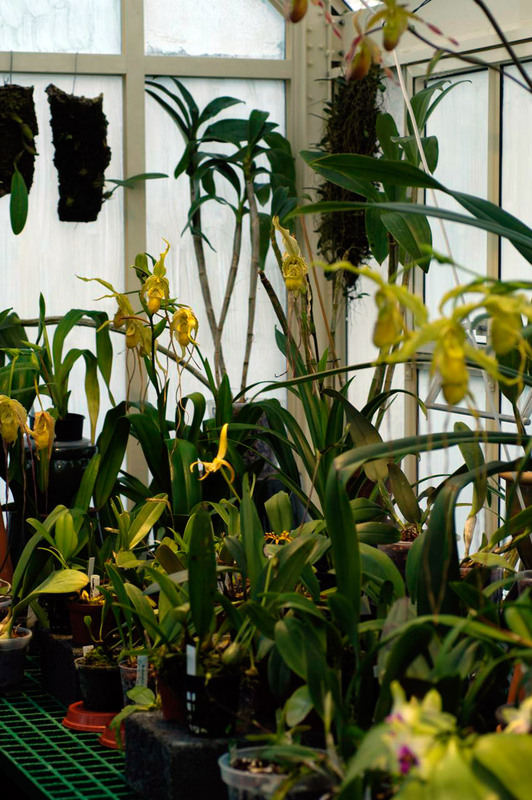 In July two new orchid essences were made, the first to be made with orchids growing in the new greenhouse. Our very good friend and wonderful therapist, Dr. Adrian Brito-Babapulle, came to visit, and in the course of the visit two orchids called out especially powerfully to him to have essences made. One of these was an orchid that Don had specifically sought in the autumn of 2007 once he read about it, as his intuition was that this particular orchid would make an important essence. 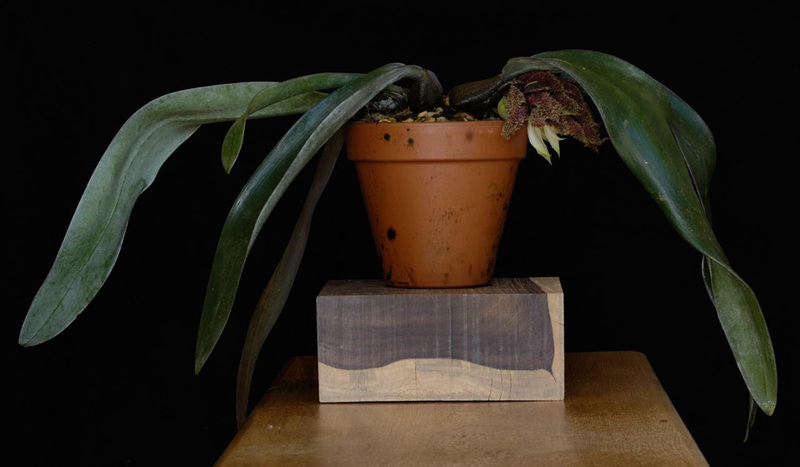 Bulbophyllum phalaenopsis (called this because its leaves look similar to the leaves of Phalaenopsis orchids) is the largest member of its genus. 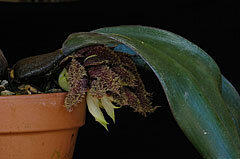 The genus Bulbophyllum is largely concentrated in SE Asia, although it is also found in both Africa and South America, one of the very few genera to be so widespread. There are over 1800 species in this one genus. The leaves can become immense: one specimen in Germany which has been lovingly grown for 30 years has leaves that are over 1.6 meters long! 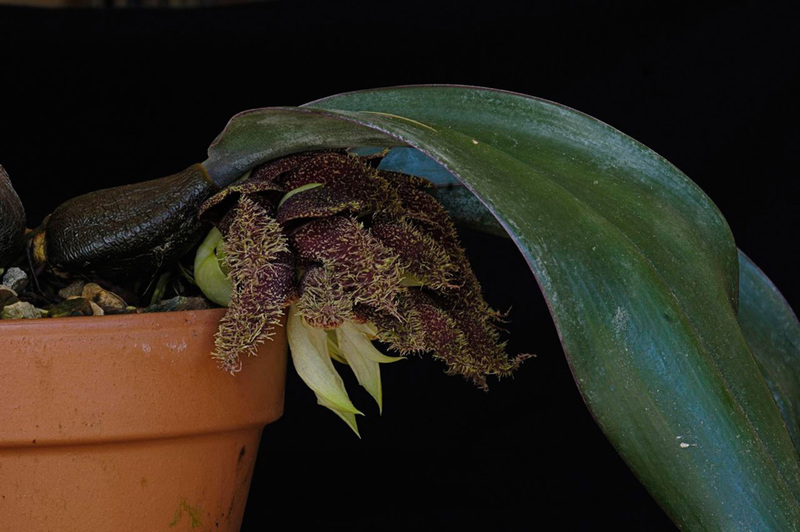 The inflorescence of Bulbophyllum is not pleasant to our noses, and its stink has been likened variously to that of rotting flesh, or the bottom of a bird's cage. The bloom is about the size of a grapfruit overall, and lasts for about one week. The essence of this orchid is called Shadow Warrior. See our description on the Single Essences page. This blood-red orchid produced an essence we call Spirit of the Higher Heart. 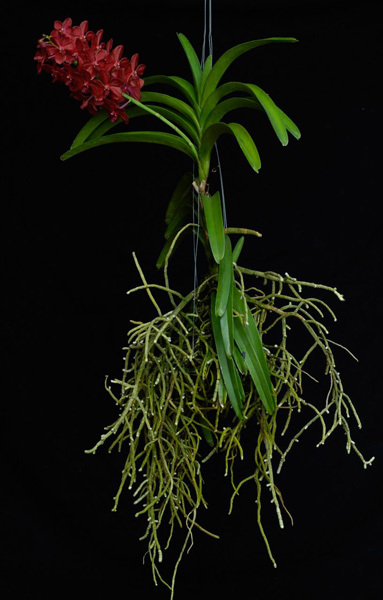 However, most people will encounter this orchid in another form, in which it is combined with an essence of 24 karat gold, which was made during the same 24 hour period, and in the same space. 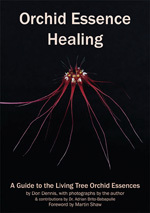 The gold essence enhances the action of the orchid, and we call this essence Healing the Higher Heart. Although this is a combination of two essences, we regard it as more akin to Clear Mind and White Beauty, both of which contain a gem essence. And so we list it as a single essence, and it is on the Single Essences page that you will find its description. Both of these have already shown themselves to be very powerful and profound essences, and we are coming to think of them already as key essences in the range. Our thanks to Dr. Brito-Babapulle for his wonderful and timely visit! 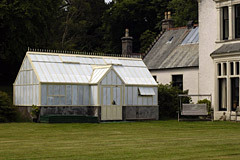 The greenhouse has been up and running since March, with a coating of white sunscreen on it since early April to protect the orchids from the sun. As most orchids grow in dappled shade in the understory of the tropical forests, very few can tolerate prolonged direct sunlight. 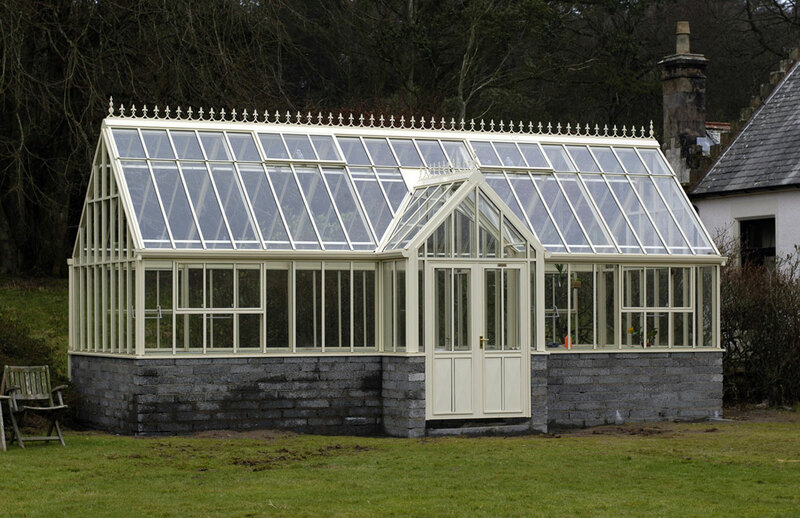 For some even this shade isn't enough, one has to find especially shady areas within the greenhouse. 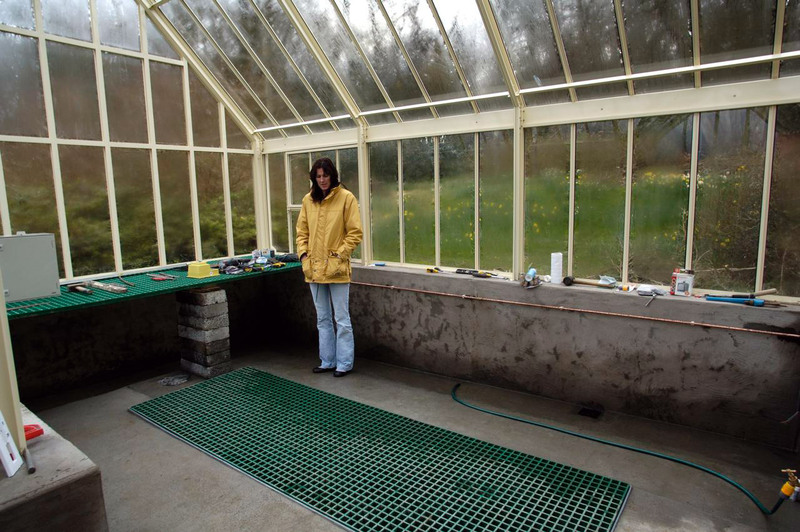 But most like the medium levels of bright ambient light, and they certainly like the humidity found in our greenhouse, thanks to the in-floor water tanks (see photos of them being installed back in February and March, then concreted into the floor by the middle of March). We maintain about 90% humidity in the two sections - one warm and one cool. 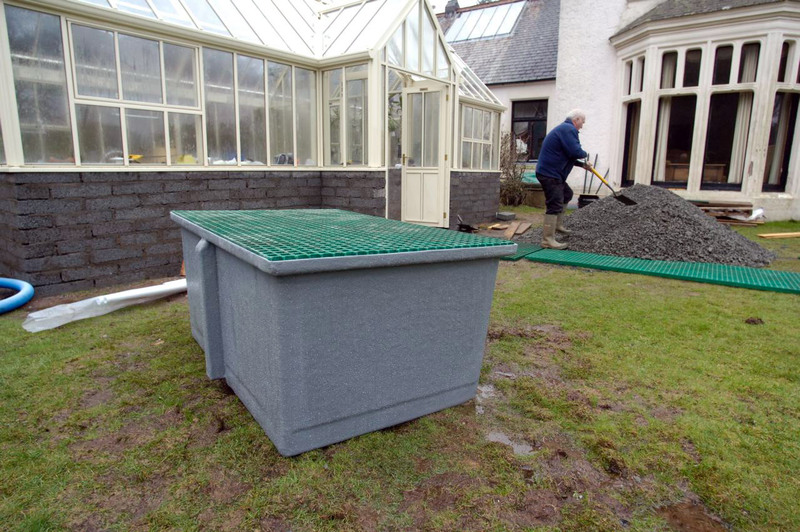 Alistair Brown, the local plumber here on Gigha, is seen in two of the photos - much of the credit for the greenhouse floor and sub-floor work, as well as the concrete rendering was down to his terrific efforts this past winter. Emma is seen standing in the newly completed interior in late March. 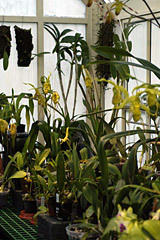 And one interior shot shows a portion of the nearly 600 orchids which are now to be found in the greenhouse. It is a wonderful and magical space, a sort of cave of wonders. 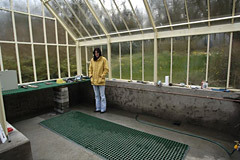 The new greenhouse is now erected, but the floor inside isn't yet finished. 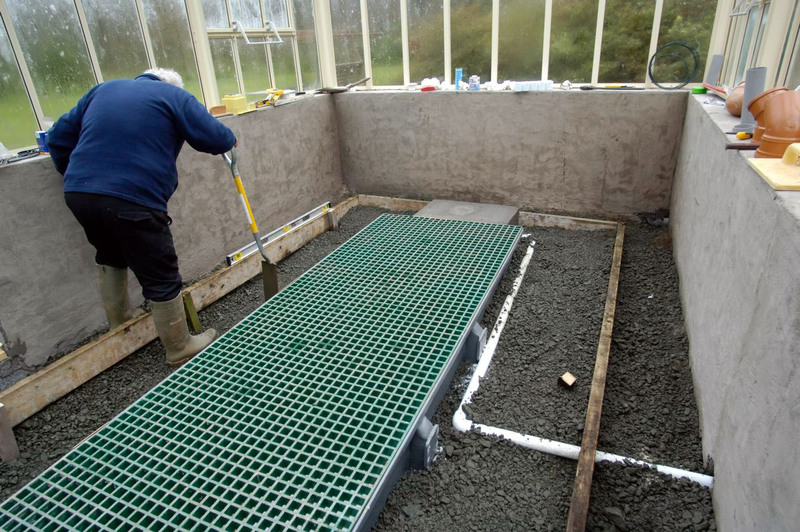 Now an in-floor water tank is being constructed for each area, to help with humidity levels, and to act as a heat sink to help prevent drastic temperature drops in the event of power going off in the middle of a winter's night. I'm now expecting the greenhouse to be completed by the end of February. Nevertheless a few orchids are hanging from wires in the roof, with fan heaters maintaining the right temperatures. And a golden-orange Potinara may just be seen on one windowsill, near the orange misting bottle. There have been two exciting developments of late for the Living Tree Orchid Essences. First of all was the publication at the end of August 2007 of the new photo-cards of the LTOE. These are the size of standard playing cards, so they fit easily in the hand or in a handbag, and as they were printed by a company that specializes in personalized playing cards, they have a great feel to them - the cards have just the right amount of 'slip' combined with an ideal weight. 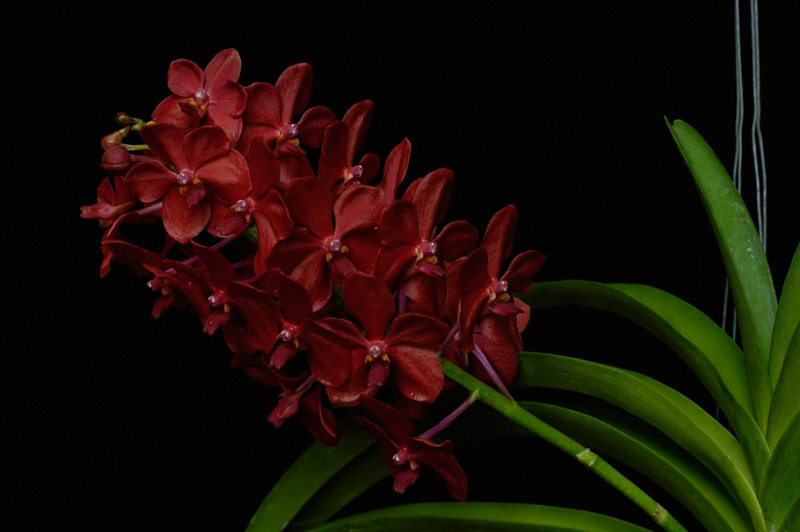 All of the photos of the orchids were taken by Don Dennis over the past 9 years. Eventually we'll get around to using these photos in a book about the LTOE, but in the meantime the cards have already proven themselves to be wonderful ambassadors for the orchids and the essences. Secondly, we are now (finally!) 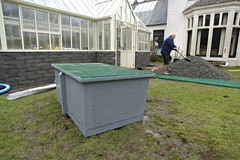 constructing a new greenhouse to be a home for the orchids themselves. 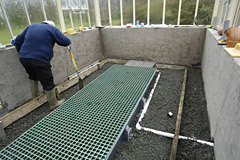 As of mid-December the foundation has been dug and poured, while on the evening of the 10th of December the numerous and various parts have been delivered by Hartley Botanic of Oldham in Lancashire. 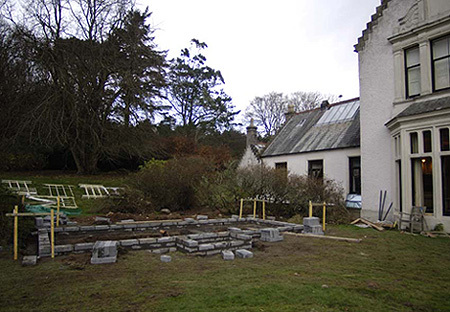 Blockwork is going up, and the team from Hartley Botanic are promising to be here on the 3rd of January to finish putting it up. That's all for now, I'll be reporting here on the completion of the greenhouse sometime in early January 2008, with any luck!